Ryerson change house, closed for good? Three rink buildings are marked as closed. One is Royalcrest. It's one of eight "unsupervised" rinks in Etobicoke, which haven't had their buildings open in winter for many years. The only other such rink mentioned on city's website is Queensway, also an unsupervised rink. It got a large, handsome new building this year, in addition to the rink building already there. Perhaps this building was left unlocked for a few hours a day when the rink first opened for the season (late) and somebody left a mess. Now this building, too, is kept locked -- after all that money spent, there is no staff placed at the building to allow community use. Ryerson is the third rink building listed as closed, but only as of today. In fact, this is the third year that the building has stayed closed. 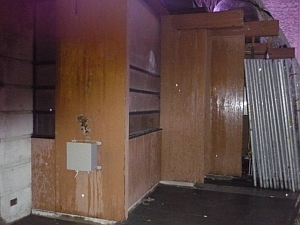 The rink was an award-winning design when it was built in the 1990's, but the change house got so little maintenance or even attention after amalgamation that it deteriorated into a slum. Construction next door at a university building appears to have been used as a handy reason to close it for good. Such mis-steps characterize too much of the city's approach to its outdoor rinks. A pity. Toronto is a surprisingly upside-down city: people who live in mansions in Rosedale get less rink fun than people who live in basement flats across from the railway tracks. Dufferin, Wallace, and Campbell rinks, in the mixed-income Ward 18 of west Toronto, are all run by the same city staff. Dufferin Rink was getting too crowded, so the staff have been trying, for a few years already, to make all three rinks as welcoming and comfortable as possible, to spread the crowds more evenly. This year City Councillor Ana Bailao gave Wallace and Campbell rink clubhouses a huge boost: she found some funds in the budget to put in proper plumbing and wiring for the clubhouse kitchens. Rink friend David Rothberg donated more funds, to equip the kitchens and also to buy more loaner skaters. 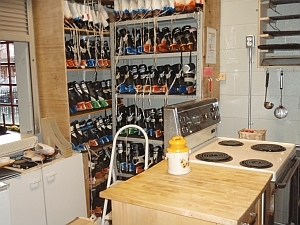 Rink staff attended bankruptcy auctions and got commercial-grade sinks and other kitchen equipment (and heavy-duty shelves for the loaner skate) at bargain prices. City staff installed everything, and all three clubhouses now work really well. This year the rink program staff are especially proud of Campbell Rink. It’s a single-pad rink and therefore more of a challenge to run. Tucked away in the middle of an economically mixed neighbourhood (beside the railway tracks and near former paint factories), the rink is a wintertime home-away-from-home for many local kids and youth. More and more young families are discovering it too, with its weekend campfires and its clubhouse reading corner and board games. On opening day, December 3, Campbell Rink was full of shinny players out on the ice. Inside the clubhouse, rink staff Marina DeLuca-Howard cooked macaroni and cheese in the new kitchen, with help from trouble-maker kids, while neighbours sat at the clubhouse tables and chatted over fair-trade coffee, and newcomers borrowed skates and sticks for their first-ever shinny game. Meantime, over at Rosedale Rink, which is surrounded by large handsome mansions, the ice wasn’t ready by opening day, so the rink couldn’t open until three days after it was supposed to. The rink change area is cramped and windowless and there is not much conversation among neighbours. Instead of being welcomed by a community kitchen with friendly staff and shelves of loaner skates, skaters at Rosedale Rink are greeted by several large vending machines. If there’s a staff person at the rink, skaters usually can’t tell, because the office is at the back of the building with, no windows. Sad, because affluent people need friendly social spaces too, and a rink in winter is a great meeting place. "The City has made every effort to open these rinks as scheduled. However, the unusually warm weather has delayed the opening of some of the outdoor rinks." But in fact, the City made very little effort to open most of these rinks. The generally accepted standard for making ice on such outdoor compressor-cooled rinks is to apply layers of water overnight for the first three-four nights. The city scheduled overnight floods on only TWO of the fourteen rinks -- Nathan Philips and Dufferin Rink -- and at Dufferin Rink water was put down for only two nights before it was due to open. Despite the insufficient flooding, the overnight protocol did allow Dufferin Rink to open on time on Nov.19. Fact: There's no premium on overnight shifts, they don't cost the city any more than daytime shifts. Of the remaining rinks, two (City Hall and Sunnydale) were held back from opening by construction delays, not, as the city's website says, by unusually warm weather. One (Hodgson) was postponed because of technical problems unrelated to weather. And the others? The two civic rinks, Scarborough and West Mall in Etobicoke, didn't even try to make ice by opening day. Neither did Rennie Rink, which has the biggest kids' hockey program in the city. And when Rennie and West Mall, both double-pad rinks, finally did begin ice-making, they only flooded the hockey side. The rink supervisor seems to believe that they can't flood the pleasure-skating side as well -- even though, in the case of Rennie Rink, the compressor power is as strong as that of Harbourfront, a non-city rink that also opened on November 19. Rennie's compressor power is 25% greater than Dufferin Rink. Staffing of ice maintenance is, as usual, quirky. Because the seasonal recall is scheduled after the rink start-up, some full-time workers who are paid over $30 an hour have been assigned double shifts to "cover" the ice-making. $60 an hour to hose water onto the rink slab every two hours, and sit in a truck in between? Using the zamboni drivers to do this makes no sense. After years of trying to help make the outdoor rinks run better, some of us are pretty sure that the city is not able to do the job. Rink conservancies may be inevitable, if Toronto's civic treasure of neighbourhood rinks is to survive. On Saturday morning, November 19 2011, fourteen municipal outdoor rinks were to be open, as directed by City Council. But only Dufferin Rink actually opened -- and that was a bit of a miracle, since the compressors were only turned on Wednesday morning, and water was only put down for two days. The city's website says "delayed opening due to mild weather" for all the others. But some of those other 13 city rinks didn't even try to open. Others that were flooded were token -- almost as if to prove that it was pointless. To cover this approach to outdoor rinks, the Parks director sent a disclaimer to all city councillors on Tuesday, saying the temperature has to be below 5 celsius for three days to make ice. The councillors will most likely take the Parks director's e-mail as gospel, but we think that his excuse doesn't work so well. For one thing, the compressor company says that ice can be made at 10 degrees if it's at night: interview with CIMCO representative. For another, rinks need to receive enough layers of water to make ice. Here's an idea: maybe it's time for the city to try a bold experiment -- follow the ice-making practices of Harbourfront rink, which is not run by the city. It's open and the ice is holding well despite the warm November sunshine. On opening day, Dufferin Rink opened for three hours in the morning, and had another hour of use at night. But having only two nights of flooding inevitably makes for a cliffhanger.